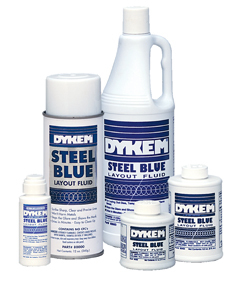 Dykem Transparent Layout Fluids temporarily color the metal and can be removed with Dykem Remover and Thinner. Gallons are available by special order. Hazardous shipping charges of $20 per gallon apply. 8 oz bottles must be shipped by ground.